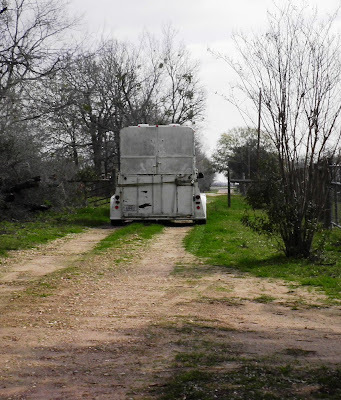 Two of the horses we thought would be with us all their lives left in a two horse trailer this afternoon, heading back to Alvin with their new owner. This will be a new chapter in their lives and, hopefully, it will be the beginning of happy times and new adventures for them. The man who bought them has a lot of kids, including two teenage boys. Yeoldfurt and I hope each of the boys will strike up a bond with one of these two horses. If that happens, the lives of those boys and these horses will be mutually enriched. The trailer they left in was a fancy rig but has seen better days. The floor was good and solid though and the latches are secure. We don't haul that often and ours is an open aluminum stock trailer. This is a two horse straight load and I wasn't sure if the horses would be balky. But they loaded right up when asked, they made me proud. Maybe it was the fresh hay I put in the mangers for them, but I like to think it was their quality upbringing. We sent them off with a 50-pound bag of feed so that if the new owner has a different type of feed, he can introduce it gradually. We gave him their bridles and bits too. They are good leather headstalls, double-stitched and well-oiled, and they are already adjusted to fit these horses. We have a surplus of tack anyway and want the transition for Lucy and Lyric to be as smooth as possible. Hopefully, a few little familiar things from home will facilitate that. The two horses that remain will have 8-1/2 acres to themselves. We expect them to be anxious and calling for their missing herdmates for a few days. It's always unsettling to a horse when members of the herd come or go. But by next weekend, they will have settled into the notion that they are the herd now ...just the two of them. The good rains we've had these past six or eight weeks have caused the grass that was so stressed by last summer's heat and lack of moisture to try and come back. 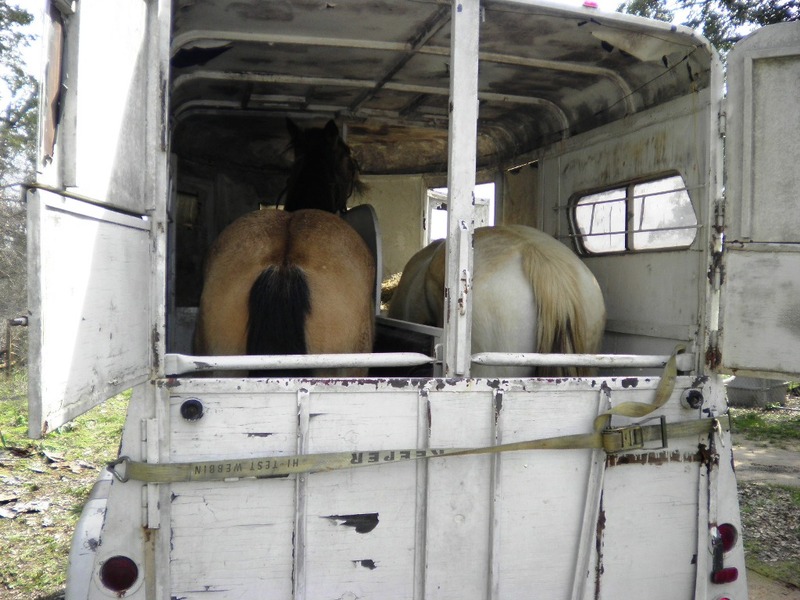 With only two horses on it now instead of four, it will recover more quickly. If the rain patterns continue through the spring and we have at least minimal rain this summer, maybe hay prices will come back down too. With only two horses on the feed/vet/hay/farrier bill now, maybe our finances might have a chance to recover too. One can hope. I took one last picture as they pulled out of the driveway. I wish them and their new owners all the best. Sometimes we have to let go of things we love in order to do right by them. I am sorry things have caused you to have to do this. If the hay situation doesn't improve soon we are going to start selling our goats (the bucks). It's either this or fence in another area which will be more expensive than buying hay and it is only a temporary cure. There is not one scrap of green brush left where they are penned now. We are lucky to have a lot of palm trees that need trimming. Papa Bear is giving them the fronds in between the bales of hay. I was hoping to keep the bucks for another form of meat supply should the need arise. Oh, HossBoss, it is heartbreaking to have to sell off much-loved horses! We have had to sell off a few goats the past few months and even that effects me. I am glad your horses are going to a good home and I think you did the best to make sure the transition was smooth and easier for them. The grass in the pasture is trying to make a come back, and maybe it will if this rain pattern just continues to at least mid-summer. I feel bad for Yeoldfurt because Lucy was his ride, his mare. She was his 'forever horse' and now she's gone. He just lost his Scarlett to old age in August so it's especially sad for him. On top of all that, today is his birthday. Helluva note when a man has to sell his 'forever horse' on his birthday. I loved Lyric too but she has always been for sale and was only with us so long because the market is so deflated. It's just a sad, sad day. I do feel good about the family that bought them and we tried to send them with plenty of stuff to get them started. We exchanged phone numbers and I told them to call me anytime if they have questions. I was real proud of how well the horse loaded in the trailer. They haven't even been asked to load up on our trailer for over a year ...but they just stepped right in when I asked them to. Good horses. Really liking the family that has them makes it a lot easier. Now if I could just find a way to cheer up Yeoldfurt. :-( And here I was being sad about my missing chicken, Miss Speckles! I am so sad that you had to say goodbye to your horses, but I know what you mean about having to let things go sometimes. I often find that after a time of letting go, there is a resurge of blessings. I hope that you will be less burdened on budget and land with the horses at a new home. We definitely understand the strain of the drought and economy, the combination was NOT good. We're okay, Lana. Sometimes life takes a twist and you just have to adjust. It's been a rough couple of years, but we are still blessed and grateful for our blessings. Thanks, Julie ...I didn't know word verification was set up on my blog! Have you seen it here before? I know you've left comments before. I think Blogger may be tweaking without my knowledge ...guess they think they know better than WE do what we need/want. Hmmm... reminds me of some folks on Capitol Hill! I found how to turn it off in Settings though, so you should not see it here again. Thanks for letting me know! That is so sad, but at least they will have a good home, people to love and take care of them, that is the main thing. It will probably take you longer to adjust than it will the horses. I can hear the sadness. I'm sorry they had to go and I'm sure they'll be happy in their new home. Not keeping them is not as sad as keeping them and not being able to do right by them. Letting them go is sadness tempered with the satisfaction of knowing they will have a good life with the family that bought them. So far the knew owner has been in touch by email every few days, to ask questions or just give me updates. I know they are in good hands and it was the right thing to do to let them go. I am so sad you had to get rid of your horses but understand why . It does sound like you found them a good home . Aw, thanks, Mrs MDR... it's always hard to let go, especially when it's something you thought you were committed to for life. But they do have a great home. I know your heart is breaking but also know you found good loving homes for them.